Team photograph. Pictured left to right: bottom row: Sue Greene, Sue Kibling, Mary Rybinski, Pat Eberle, Laurie Kozofsky, Jamie Jarvis, Cindy Haynes, Kathleen Harris, Catherine De Garmo. 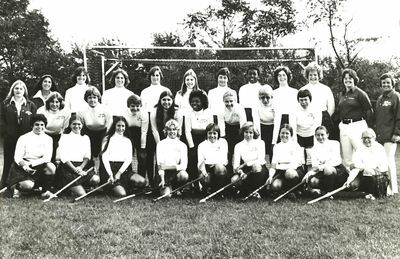 2nd row: Kathy Matejka, Gail Hamilton, Charlyn Robert (captain), Meryl Sheard, Kim Witherspoon, Kim Nielsen, Deb Bell, Cheryl Horton. Standing: Donna Cuddihy (manager), Dulce Fernandez (manager), Jeanne Boice, Ellen Rothenburg, Therese Goode, Barbara Ryan, Kathy Lawler, Vanessa Hamilton, Cathy Caldwell, Anna Meyer, Cathy Mahoney (trainer), Carole Mushier (coach).